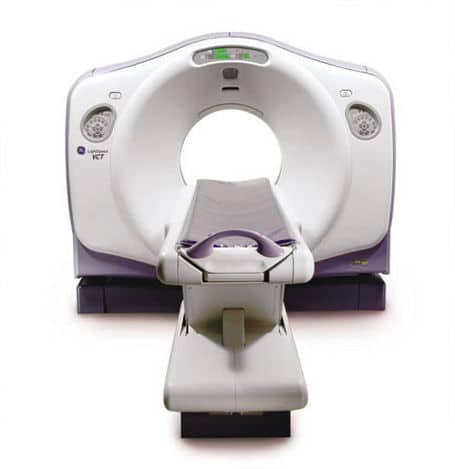 The GE LightSpeed is a third generation multi-slice helical CT scanner featuring a 53 kW generator, 6.3 MHU tube and a fast gantry rotation time of 0.5 seconds. The LightSpeed 16 is capable of imaging 16 slices per rotation with main collimators of 16 x 0.63 mm and 16 x 1.25 mm. In addition, 2 x 0.63, 1 x 1.25, 1 x 5, 4 x 3.75, 8 x 1.25 and 8 x 2.5 mm slice modes are also available. It has 24 parallel rows of solid state detectors covering 20 mm in the z-direction at the isocenter. The main difference between the LightSpeed 16 and previous models is that the data acquisition system has been upgraded to record 16 channels of data simultaneously. In addition, the detector matrix has been re-designed so that the central 8 rows have been divided in two to give 16 x 0.63 mm slices. The LightSpeed Ultra is capable of imaging 8 slices per rotation with slice widths of 8 x 1.25 mm and 8 x 2.5 mm, as well as four slice acquisitions from 4 x 1.25 mm to 4 x 5 mm slices. Also available are 2 x 0.63 mm and 1 x 1.25 mm slice modes. It has 16 parallel rows of solid-state detectors covering 20 mm in the z-direction at the isocenter. The primary difference between a LightSpeed Ultra and a LightSpeed Plus is that the LightSpeed Plus is capable of acquiring 4 slices per rotation as compared to 8 on the Ultra.